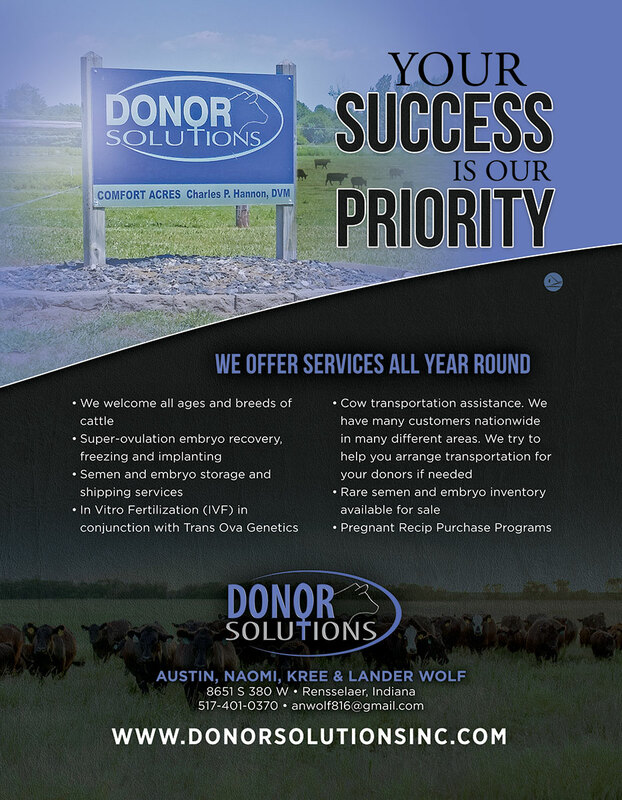 Donor Solutions Inc. – Offering the best genetics through our Featured Donors. Welcome to Donor Solutions, Inc.
At Donor Solutions, we greatly appreciate you taking the time to look into our company. We hope that the new website will help you to understand the goals and services of Donor Solutions. Donor Solutions was formed in 2007 with a vision of caring for and managing the production of donor cows from many different customers in many different states. Since then we have had the privilege of working with cows from Indiana, Illinois, Ohio, Michigan, Kentucky, Iowa, Nebraska, Missouri, Pennsylvania, and even cows from as far away as Texas and Louisiana. For a detailed list of some of our past and current customers you can look at our Customer Success page. At Donor Solutions we have a desire to care for your cows as if they were our own. We try to maximize the production of the cows here by making their living conditions as comfortable as possible. The main reason we purchased this piece of property for our facility is due to the sandy soil. This alone is one of the biggest factors we have that allows us to keep cows in the most comfortable conditions. We believe that the micro-management of their nutrition, mineral intake, and environment are the things that help us to maximize their production and in the end maximize your income from them. Since opening the doors in 2007 we have flushed on average about 350 to 400 cows per year. We have had the privilege of working with some of the best cows and best people in the country. We have also tried to put together an extremely deep set of donor cows of our own. We have tried to represent a variety of breeds in our line of donors and we encourage you to check them out. We always have genetics available for sale out of our donors. We always look forward to the opportunity of working with new customers and cows and are always here to answer any questions you may have. AT DONOR SOLUTIONS WE HAVE A DESIRE TO CARE FOR YOUR COWS AS IF THEY WERE OUR OWN.